Springtail (Protaphorura fimata) (Figure 1) is a serious pest of lettuce in the northern part of Salinas Valley of California. The direct seeded young lettuce seedlings in fields with high densities of springtail show retarded or stunted growth and do not emerge in a synchronous pattern (Figure 2). Springtails are reported to feed on soil fungi, decaying plant materials and live roots. Springtails attack the germinating seeds of the lettuce, but it is not certain if irregular or inconsistent plant stand is due to the persistent feeding by springtail on both germinating and developing seedling stages of lettuce. 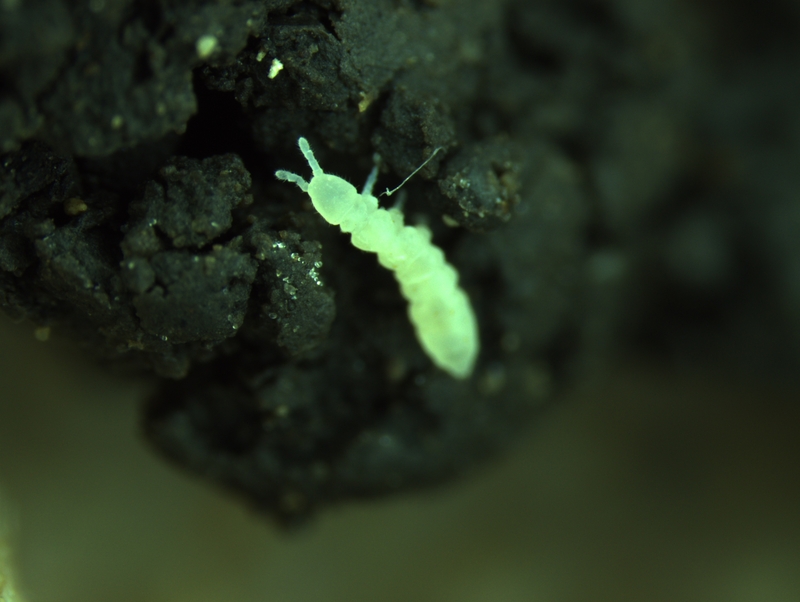 Springtail continue to occur in the soil beyond 30 days after planting. Knowing the most vulnerable stage(s) of lettuce to springtail feeding will help in determining the best timing for control measure intervention to achieve a uniform lettuce stand. 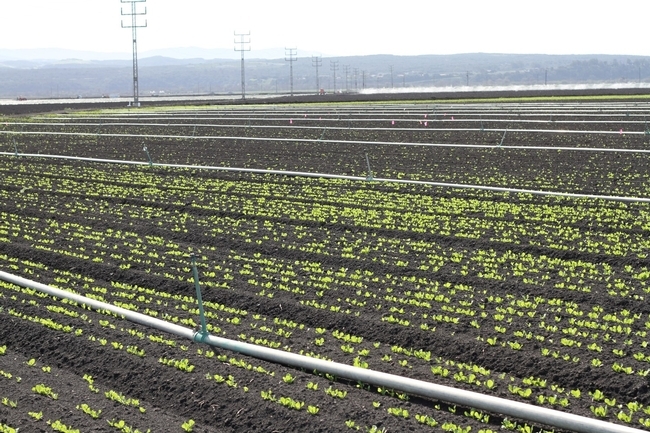 Lettuce fields are heavily irrigated at least once before and up to three weeks after planting the seeds for uniform seed germination and seedling establishment. However, the behavioral response of springtail to feeding injury on lettuce under high soil moisture condition has not yet been studied in the central coast of California. Similarly, the temperature has a profound impact on lettuce plant development as well as the growth and activities of springtail. 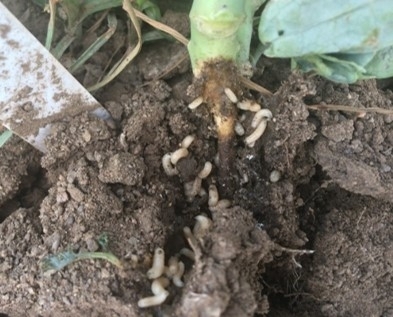 Springtail has been found causing crop losses during February to May in the Salinas Valley and beyond June, springtail related problems are not widely reported. 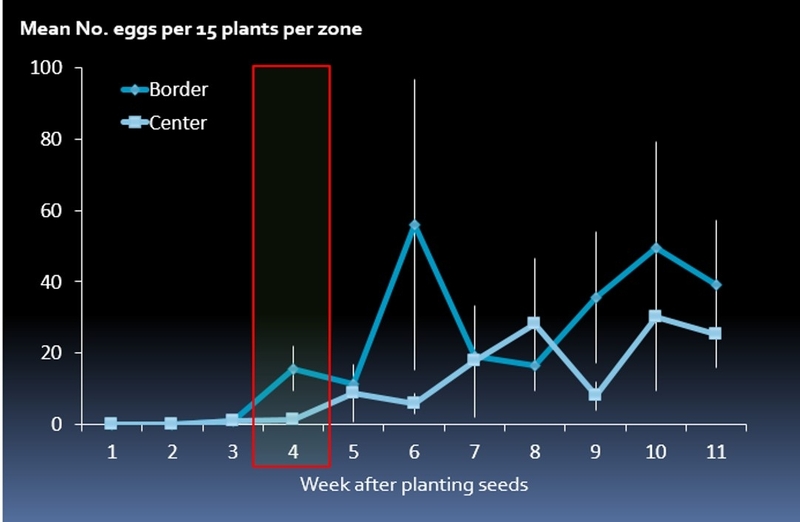 Perhaps slower lettuce seed germination and subsequent development during cooler seasons (January to May) is the pre-disposing factor as seedlings are exposed to springtails for an extended time frame than during the rest of the year. The relationship between temperature and springtail feeding of germinating lettuce seeds has not been investigated. A study was conducted to determine the effect of germinating stages of lettuce seeds (up to 7 days after planting), soil temperature and moisture to springtail feeding injury. Germinating seeds or one day old lettuce seedlings were the most vulnerable stage to springtail feeding, resulting in reduction in seedling growth. Thus, it appears that once the roots are established in the soil, lettuce is less susceptible to springtail feeding injury. Because the germinating phase of the plants is more likely to be injured, springtail monitoring activity should start prior to planting the seeds to determine the presence of springtail in the soil. Previous studies showed that, beet or potato slice baits attract springtail if placed in the top layer of the soil; thus, these baits could be used for monitoring springtail activity in the soil. If the soil is not moist, the baits may not capture springtail and springtail activity may go undetected. When the experiments were conducted with germination phase in the temperatures as low as 41°F, springtail feeding was still evident. This suggests that although the seed germination and seedling development is progressing slowly in the cooler temperatures, springtail can be still active in feeding if there is sufficient moisture in the soil. Also, this suggests that lettuce seedlings might require prolonged protection from springtail with additional insecticide sprays until the seedlings are established in the cooler temperatures especially in spring and early summer (January to May). In the later part of summer and fall, the temperatures are higher than 60°F even at nights, which allows the seeds to germinate and develop quickly and not providing springtail to persistently feed and cause economic damage. In these circumstances, an at-plant application of insecticide is likely to provide adequate springtail control and multiple applications may not be required. High moisture content in the soil will favor springtail feeding on the germinating lettuce seeds. In the Salinas Valley, before the lettuce seeds are planted, fields are pre-irrigated to aid land preparation and bed shaping. It has been observed that the springtail density increased from the sub-surface of soil when the field was recently irrigated or after a rain event. This cultural practice which maintains high moisture levels for seed germination on the sub-surface profiles of the soil might be favoring the faster buildup of springtail populations. 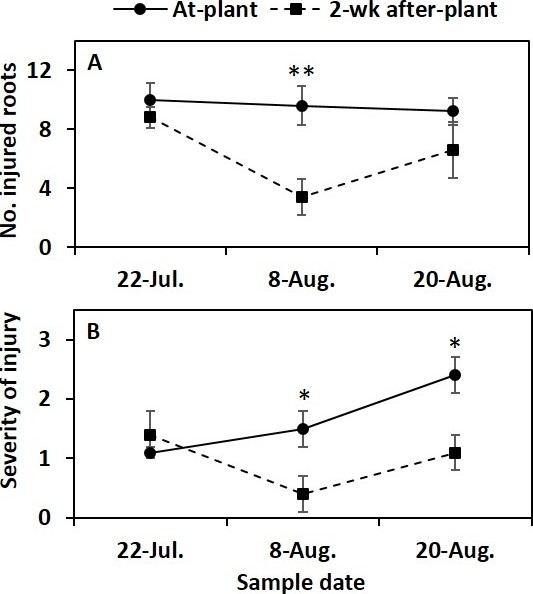 Springtail captures in bait traps were greater immediately after irrigation. Clearly, this study demonstrates that early lettuce seed development stages are the most vulnerable to springtail feeding injury. Moisture has a profound effect on springtail feeding on germinating lettuce seeds. This study also suggests that springtail can attack the germinating lettuce seeds at all growing temperatures in the Salinas Valley, although the seed germination and subsequent seedling development at cooler temperatures would increase the vulnerability of lettuce seeds to springtail feeding. This information provides insights not only on the timing of protection but the extent of protection under various temperature ranges also in managing springtail in the Salinas Valley. Plants growing the cooler temperature need prolonged protection for springtail if adequate moisture is present in the top soil of the bed. In the warmer temperatures, seed development would occur rather quickly which suggests that prolonged protection against springtail is not necessary. 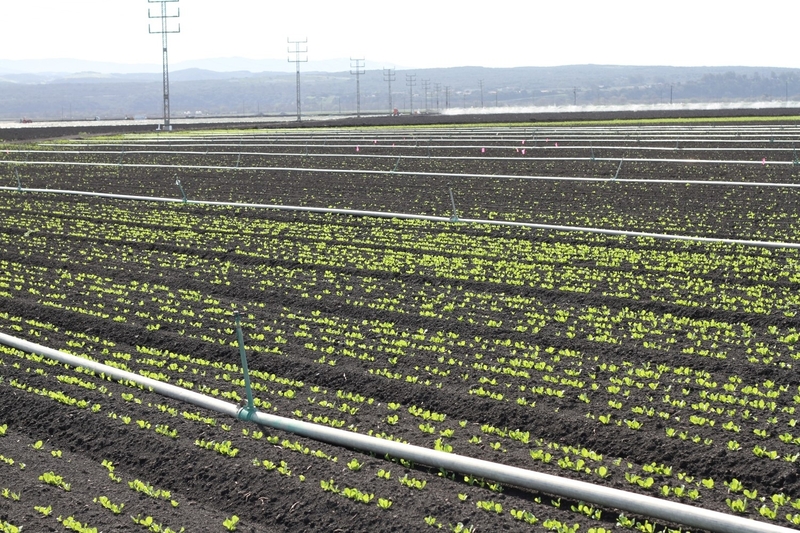 These results warrant the need for more field studies on protecting lettuce seeds from springtail in the cooler temperatures especially during spring and early summer lettuce plantings in the Salinas Valley. Cabbage maggot (Delia radicum) (Fig. 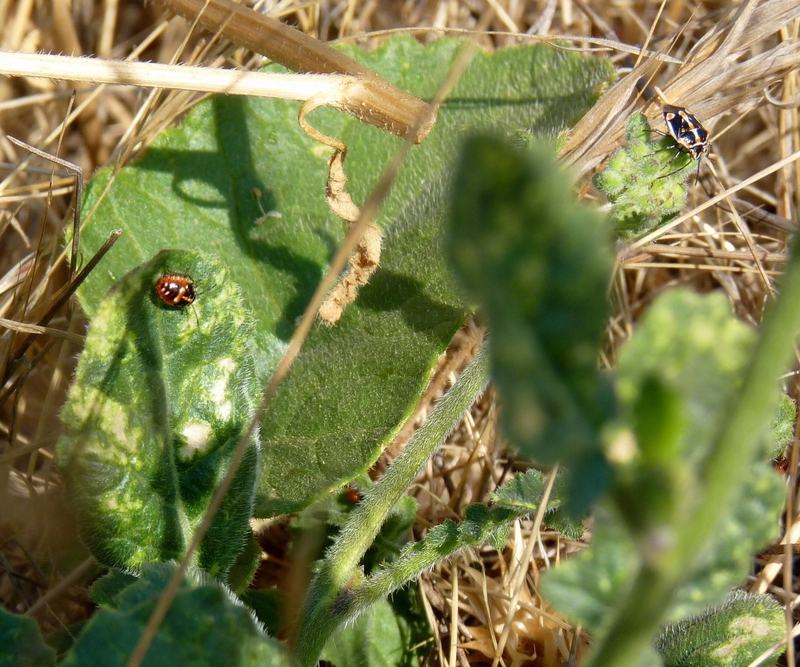 1) is a serious and destructive pest of brassicas in the Salinas Valley of California. 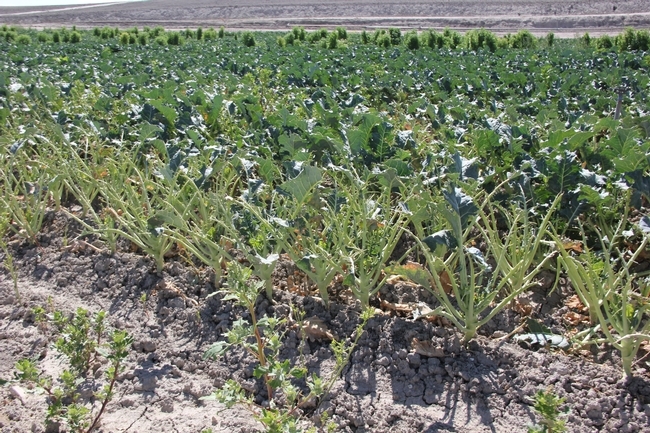 Brassica crops damaged by cabbage maggot are broccoli, cauliflower, cabbage, and Brussels sprouts. 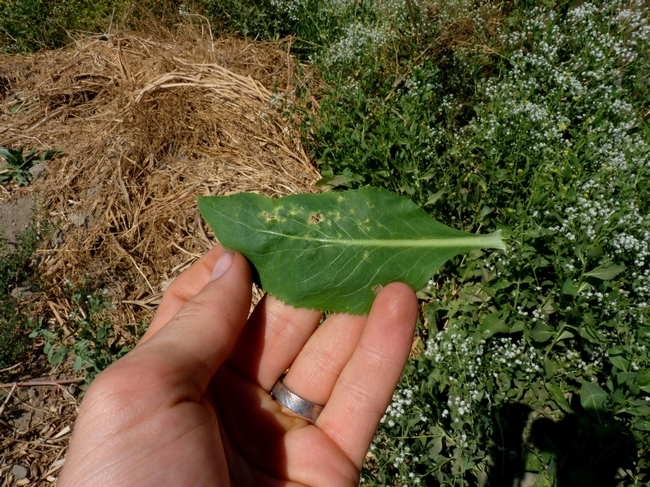 Cabbage maggot flies lay eggs in the soil around the base of a plant. 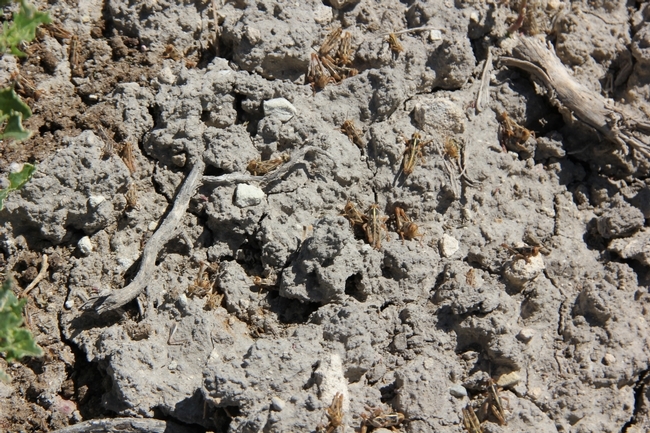 Legless, white maggots feed on the taproot and affect plant development. After feeding for about 3 weeks, the maggot pupates in the surrounding soil for 2-4 weeks before emerging into an adult fly. The symptoms of cabbage maggot feeding in the root are yellowing, stunting, and slow growth. Research showed that infestation by cabbage maggots in direct-seeded broccoli could be severe throughout the growing period, except the first 30 days after seed was planted. Typically, insecticide targeting cabbage maggot is applied immediately after planting seeds and before sprinkler is turned on. Efficacy studies with at-planting application of insecticide did not provide adequate cabbage maggot control. This suggested that insecticide applied at planting might be early relative to cabbage maggot incidence and thus, delaying application might be more effective. In 2014 and 2015, replicated experiments were done in a commercial planting of baby turnip. 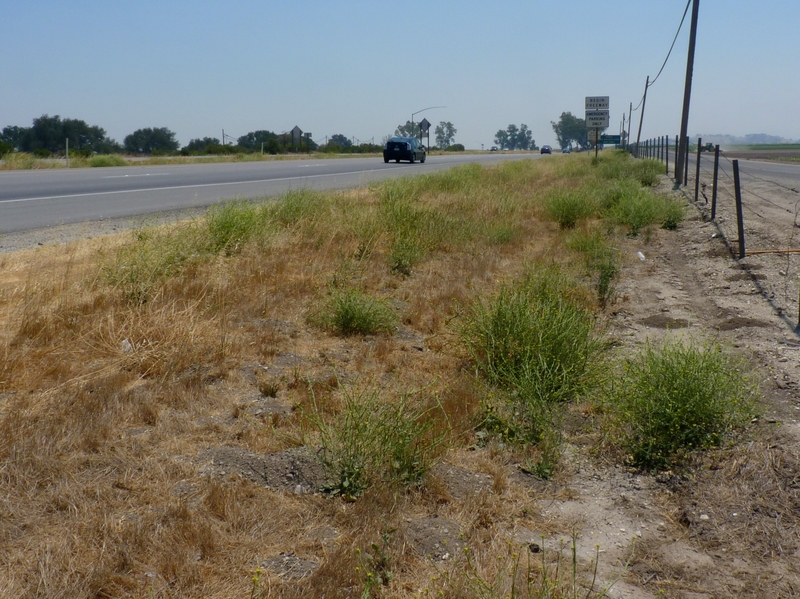 The treatments were one chlorpyrifos application at planting and 2 weeks after planting seeds. A tractor-mounted sprayer was used to apply insecticide. Samples were collected and were transported to UCCE entomology laboratory where roots were evaluated for damage by cabbage maggot. 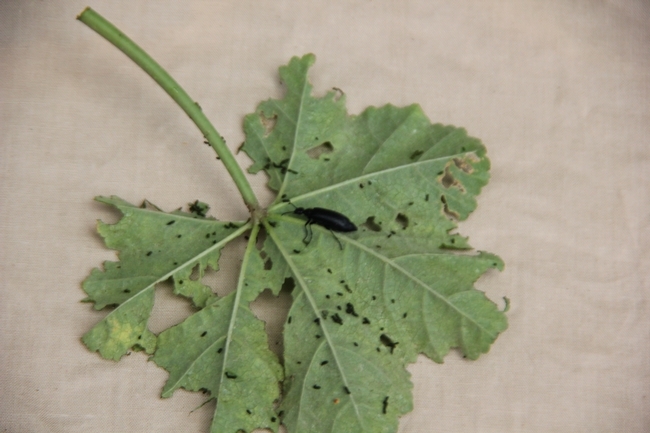 Results suggested that delayed application of effective insecticide suppresses cabbage maggot (Fig. 2). 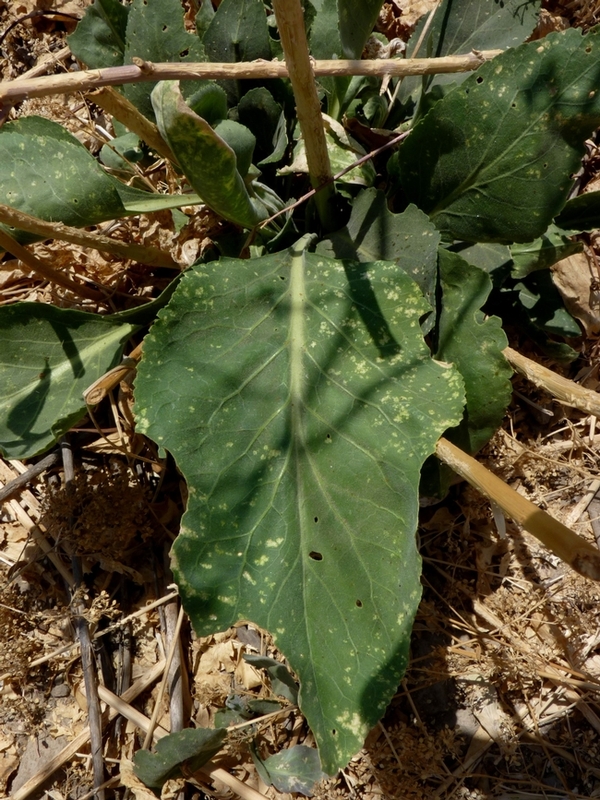 In a previous study, Joseph and Martinez (2014) showed cabbage maggot flies did not lay many eggs at the base of brassica plants until 3 weeks after plant emergence (Fig. 3), despite adult cabbage maggots in the field during early stages of plant development. Also, cabbage maggot infestation tend to be continuous after 3 week stage depending on local pest pressure and crop disturbances (e.g., harvest) in the surrounding fields (Joseph and Martinez 2014). 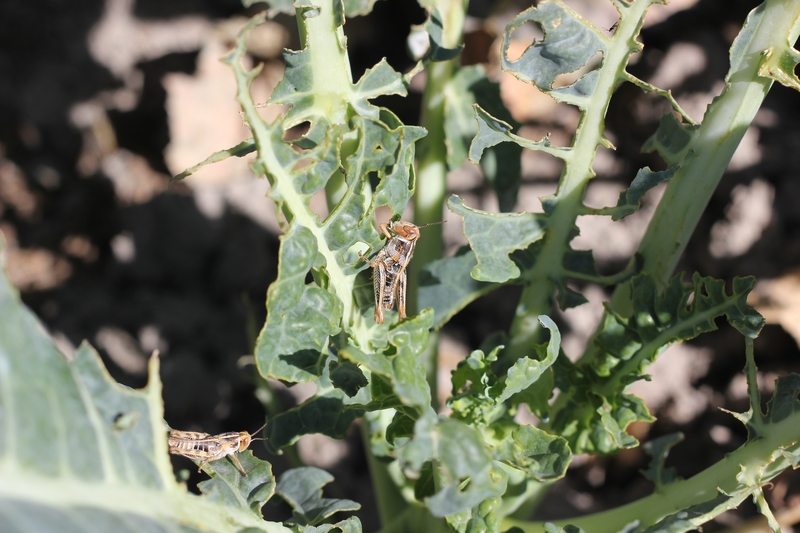 Delaying insecticide application would increase the likelihood of intercepting cabbage maggot larvae seeking roots. 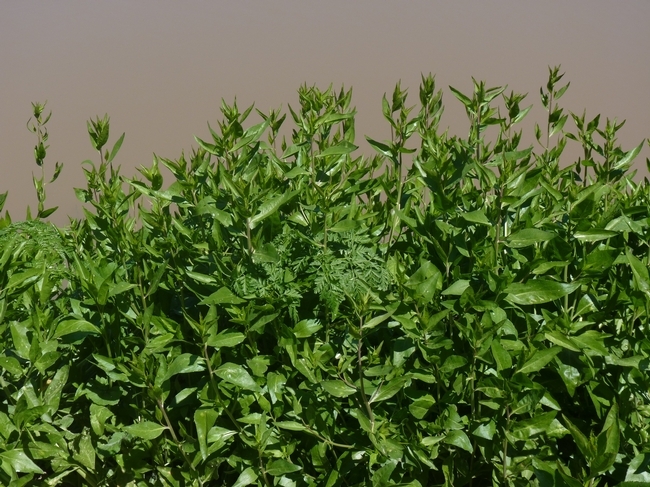 In the Salinas Valley of California, use of organophosphate insecticides including chlorpyrifos is regulated. This stringent regulation is forcing growers to seek alternate insecticides for cabbage maggot control. Previous study showed that clothianidin, thiamethoxam, and spinetoram as well as pyrethroid insecticides such as zeta-cypermethrin, fenpropathrin, bifenthrin, lambda-cyhalothrin, and pyrethrins were effective against cabbage maggot larvae, and efficacy was comparable to chlorpyrifos (Joseph and Zarate 2015). However, alternate insecticides are likely to be less persistent because they break down quickly (e.g., spinetoram) or become immobile in soil under field conditions because they bind to organic matter in contact (e.g., pyrethroid insecticides). Thus, as fewer effective older chemistries (e.g., organophosphate insecticides) are used against cabbage maggot because of use restrictions, delayed application of insecticide might be more critical. Joseph, S. V.,and J. Martinez. 2014. 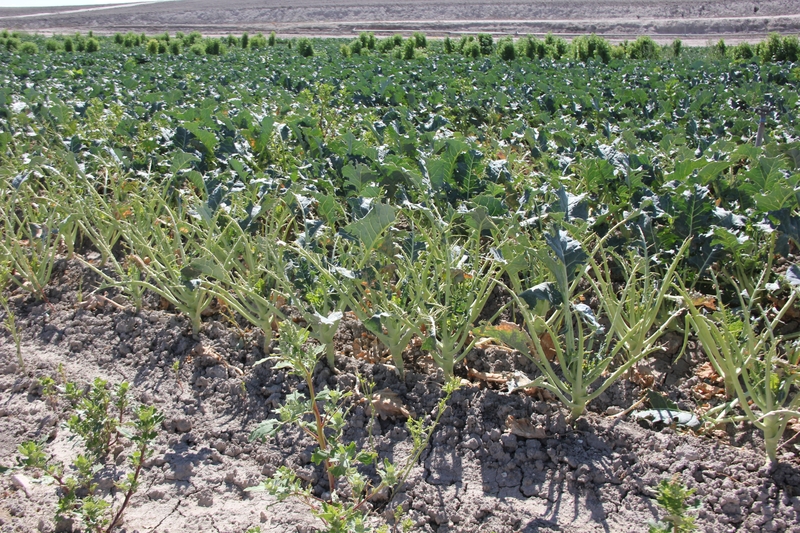 Incidence of cabbage maggot (Diptera: Anthomyiidae) infestation and plant damage in seeded brassica fields in California's Central Coast. Crop Prot. 62: 72-78. Joseph, S. V., and J. Zarate. 2015. Comparing efficacy of insecticides against cabbage maggot (Diptera: Anthomyiidae) in the laboratory. Crop Prot. 77: 148-156. 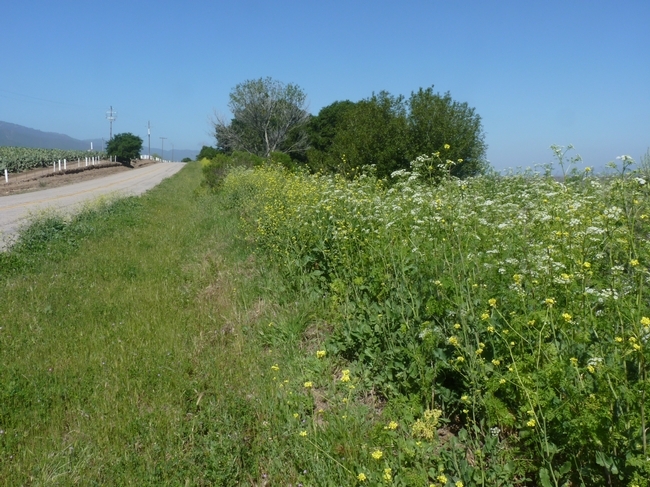 Recently (mid April), a large number of grasshoppers has been found attacking broccoli and spinach crops in the southern parts of Salinas Valley (San Lucas, San Ardo etc). It is believed that these grasshopper populations were migrating from the dry grassland to leafy greens and Brassica crops. 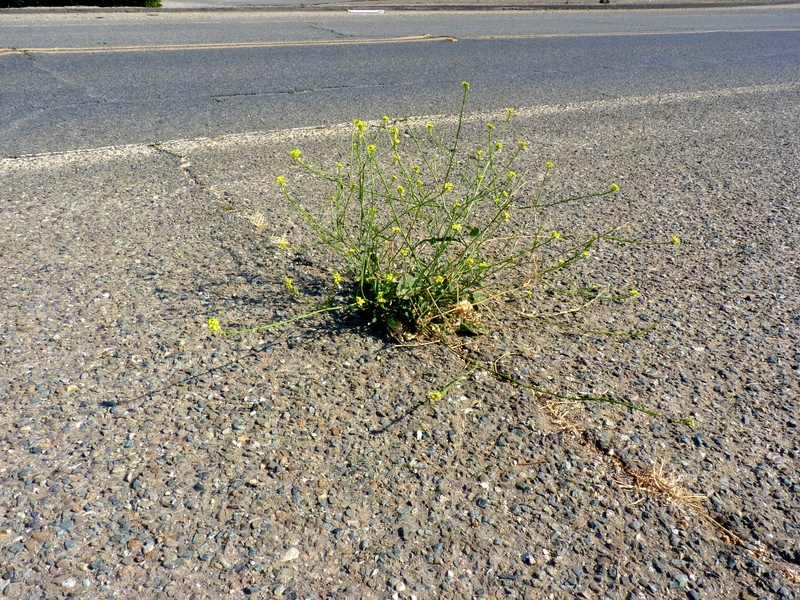 The feeding damage was typically found along the edge of the fields adjacent to the hills. 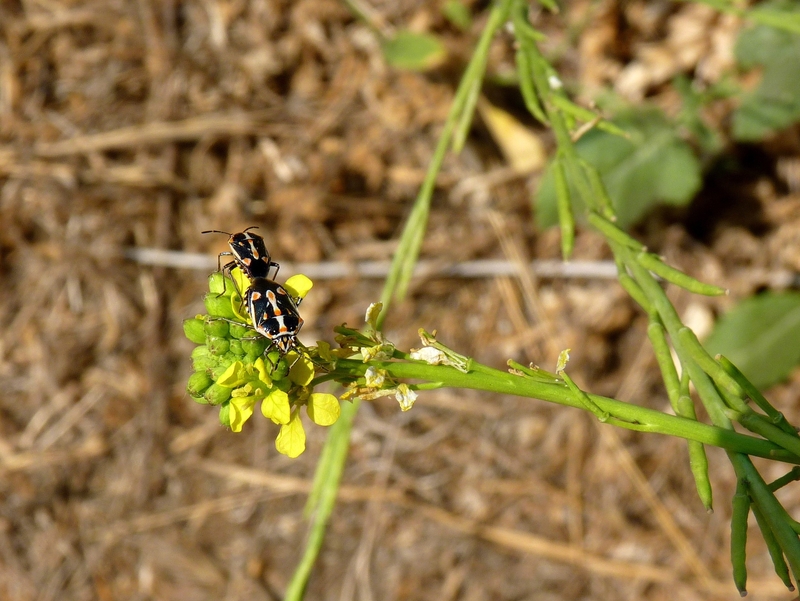 Also, blister beetles (Epicauta spp.) were seen along with grasshoppers. Blister beetles were mostly feeding on the weed plants surrounding the fields. The feeding damage may not be critical but these insects may contaminate the harvested produce with dead or alive bodies and their excrement. The blister beetle adult is about an inch long, and blackish blue in color. Blister beetle has a distinct look that make them easy to identify from other beetles. The width of the neck is shorter than width of the head. The outer pair of fore wing is flimsy and not held tight on the abdomen. 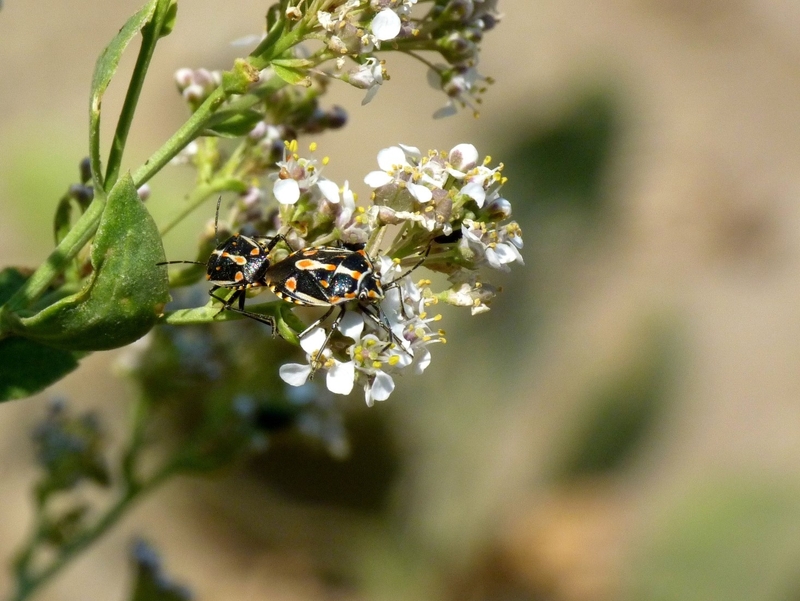 Ecologically, both grasshopper and blister beetle interact with each other. The larval stages of blister beetle are predaceous and often prey on the eggs of grasshopper. Grasshopper lays eggs in a pod (120 eggs maximum) below the soil. The eggs hatch to first instar nymphs which molt through six nymphal stages before develop into adults. The nymphal stages are wingless but the late nymphal stages have wing pads (incomplete wings). Nymphal stages move only by jumping whereas adults can fly and jump. Most of the grasshoppers found in the fields are nymphs and they are found in aggregation feeding on the broccoli plants. It seems like they like broccoli than spinach. Grasshoppers are migratory in nature meaning they feed on what they find on their way and as the food resource depletes, they move on to another green patch. Because of the greater size and high mobility, it is relatively difficult to kill these grasshoppers using insecticides. 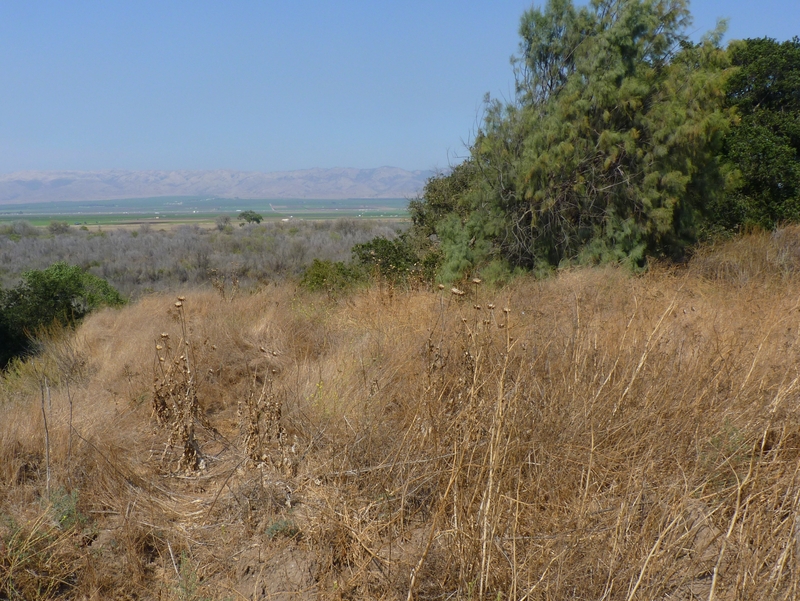 In the Salinas Valley, the wee and morning hours are cooler and grasshoppers are less active and remain in the ground waiting for the day to warms up. These early day time might be the best time for insecticide application but still, they might move away when the sprayer equipment approach them. Pyrethroid insecticides and acephate are effective but multiple applications might be warranted because grasshoppers are continuously moving in from the nearby dry grassland. Please check the label instructions before selecting the insecticide for grasshopper control. Management of grasshopper using organic insecticides will be a greater challenge than synthetic insecticides. Organically approved insecticides such as pyrethrum (Pyganic) might be the option. 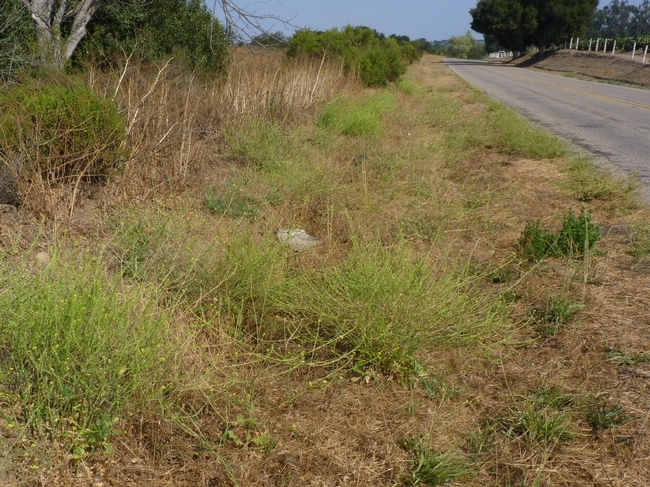 Because grasshoppers feed on plant material, spinosad (Entrust) might be effective too. Azadirachtin (Neem products) may provide some repellency. However, success is not guaranteed with any of these insecticides. There is a protozoan, Nosema locustae -- commercially available as a bait under the brand name Semaspore. The bran bait is mixed with spores and the spores enter their body while feeding. This bait is slow acting and success may vary. Physical barrier such as fencing between field and grassland might help but a spray on the barrier might check them from progressively moving into the field. Smaller production can use row covers to prevent their access to the crops. Managing grasshoppers in the grassland with approved insecticides might slow down the migration.